Let’s face it, Adobe’s traditional product prices seemed expensive over the years, espe­cially if you’re on a student’s budget. The last perpetual version available, Creative Suite 6 from 2012, historically had full prices ranging from $399 for Dream­weaver through $999 for Photoshop Extended and on up to $2,599 upfront for the Master Collection suite, which contained all CS6 applications. As cool and powerful as this software was, it’s hard to afford when you’re in school – even after the student/teacher discount. Adobe eventually stopped selling CS6, as the version reached EOL and end of support – but fortunately the company still offers deep discounts for education customers on the latest CC release. 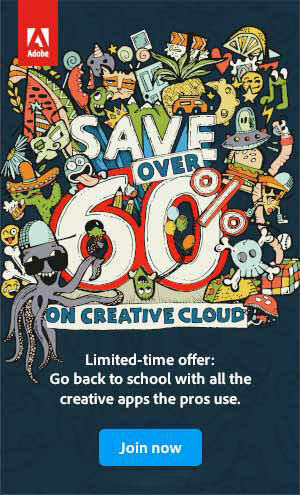 A few years ago, in fact, they increased the discount on Creative Cloud to up to 70% off the regular prices. And while there are a lot of misconceptions about CC, the main products like Photoshop, Illustrator, InDesign, Premiere, etc., still download and run on your desktop as normal. The standard pricing for Adobe’s new CC 2015 release – their flagship Creative Cloud all-in-one offering – is US$50 a month with an annual membership. But what about education customers? How much is the academic discount? What’s the Difference Between Adobe Student Editions vs. Regular? 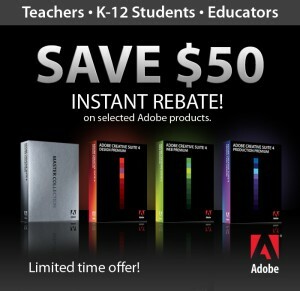 The Adobe Student and Teacher Editions look like a great deal. They offer big discounts, as much as 70% off normal prices. They’re available for most of Adobe’s most popular products, including the Creative Cloud (CC), Creative Suite 6, Lightroom 5, Acrobat XI, and Elements 13. They can be purchased by anyone who qualifies – primary, middle, and secondary school students, homeschoolers, college or university students, faculty, teachers, and administrators. Even part-time students or teachers can be eligible, and there is no maximum age limitation. They’re available pretty much worldwide in many languages on both Windows and Mac OS, and you don’t need any kind of coupon or promotion code to get the deep discounts. Here we are, it’s that time of year again – it’s back to school, and the sales that often come with it… So for a limited time, Adobe is offering a special deal for students and teachers. In addition to the regular education discount of 60+% off of the standard price for an annual CC membership, you can now also get one month free when you prepay for your first year of Creative Cloud. And you get the complete Creative Cloud – the latest CC 2019 desktop releases of all of the tools and services contained in the collec­tion, including Photoshop CC, Illustrator CC, InDesign CC, Lightroom CC, Dream­weaver CC, Premiere Pro CC, After Effects CC, Audi­tion CC, Acrobat DC, and more. These CC 2018 versions contain thousands of new features and improve­ments compared to 2012’s CS6. Anyway, it’s that time again – at least for the sales to start. Adobe is now offering up to $100 off the already-discounted prices of the new Creative Suite 6 Student and Teacher Editions with our special promotion code below in the North America Education Store. Meanwhile, customers in UK/Europe can save €75/£65 on CS6 Premium suites plus get free shipping! This extra bonus means that the savings for most of these products approaches 80% off the regular prices… To get the discount applied to your online order, you just need to use our exclusive promotion code “BTS12PRODESIGN” at checkout. Internationally, no offer code is needed to get the savings – just visit the online Adobe Education Store in your region. This is for North America – however for customers in UK/Europe, Adobe is offering a further €50/£40 discount on Education Editions until 16 March 2012. 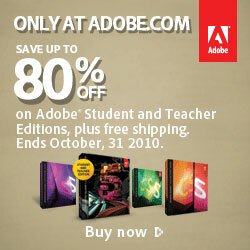 Adobe’s Student and Teacher Editions are already a pretty sweet deal. If you’re eligible, you can get huge discounts off Adobe’s normal prices for software that works the same as the standard editions. Please consult the CS5.5 System Requirements for complete platform information. Adobe has just rolled out a couple of nice offers for Labor Day and the back-to-school season… The first promotion is for all commercial customers, and the second bonus is specifically for education (students, teachers, and staff). In North America: Receive a savings of 10% on any order of $375 or more purchased through the Adobe Commercial Store (any products). Valid for customers with shipping addresses in the U.S., Canada, and Mexico, excluding Volume and Education Stores, with no coupon code necessary. Offer available August 24, 2011 – September 8, 2011. In Europe: Take 10% off orders €400/£350 or more in the Europe Commercial Store with coupon code Adobe10 (any software, full or upgrade). Offer available 29 August 2011 – 9 September 2011. Adobe’s Back-to-School promotion is live: Save up to 80% on Adobe Student and Teacher Editions, plus get free FedEx shipping… This offer is valid on all Education software products until October 31st in North America, and until November 23rd inter­nationally. Check out the details for this deal below. Adobe’s Education editions are available for almost all products (CS5, Photoshop, Lightroom, Acrobat, Elements, Captivate, etc), and are just like their standard versions, with only a few differences. This special is available only on orders made via the Adobe Education Stores to customers in the United States, Canada, Austria, Belgium, Denmark, Finland, France, Germany, Ireland, Italy, Luxembourg, Netherlands, Norway, Portugal, Spain, Sweden, Switzerland, and the United Kingdom. OEM and volume licensing customers are not eligible for this promotion. This free shipping offer is stackable and may be used in conjunction with any other discounts.